We’ve recently shared some important news: DocOrigin has been enhanced to drive Zebra® printers at rated speeds when used in a single facility installation or globally distributed printing environments. A sample of the forms, labels and documents that are possible with DocOrigin and Zebra printers. DocOrigin’s production software allows customers to drive an unlimited1 number of printers locally or globally. DocOrigin ZPL Viewer allows the person designing and testing labels to preview them in a PDF viewer. This adds convenience and reduces the cost of label development and testing. With ZPL Viewer, you can view a single label or hundreds, reducing ribbon and label waste. Make QA and Test a snap! DocOrigin drives powerful Zebra printers at full speed, meeting all mission-critical business demands. 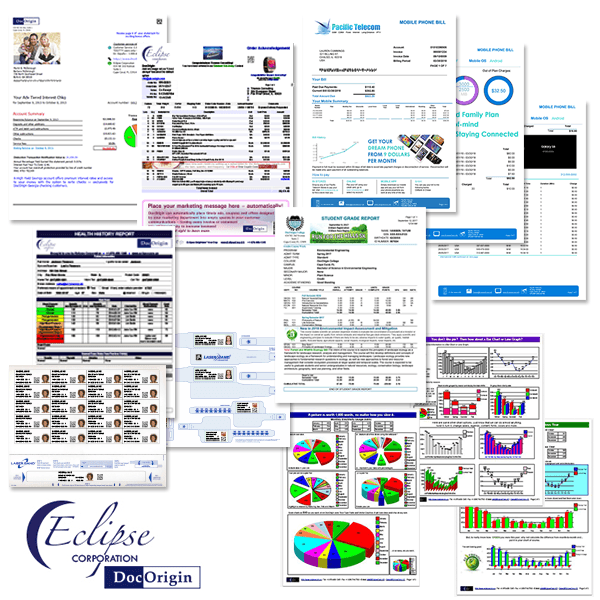 Integration Without Modification™, Eclipse’s methodology, gives customers the ability to design and produce dynamic data-driven labels without customizing their line of business software, and eliminates the need for change orders or custom programming.